i’m always on the lookout for good interior pieces. this gold nina side table from chelsey elizabeth design is modern without being too steril or cold. i think it would be a great side table for a bedroom. today we’re giving you a chance to win it! 1. visit chelsey elizabeth designs and pick your favorite item and comment below to tell us what it is! one winner will be selected on wednesday, may 15th at 10am PST. open to US residents only. value is $358. UPDATE: winner is #255 farrell! The moroccan floor runner is GORGEOUS! The Adele Chandelier would look awesome in my bedroom! Its gorgeous! I love the Sepia Moroccan Pattern Throw! love this and the tufted ottoman is pretty killer as well! The Murphy footstool is just what I’m looking for! I love that Maxwell stool. And the Free Fall painting! What a fantastic shop. I love the Adele chandelier! I love the Sepia Triange Throw, so gorgeous! I am in love with the Isabelle Coffee Table. So gorgeous! The Jules Chest has so much character. I love it! Hm, that’s tough. There are a ton of goodies on the site. I love the sunburst mirror though. Thanks! The Industrial Wire Baskets are exactly what I’ve been looking for. Loving their indigo dyed circle throw! I love the artichoke sculptures set! So rad. The orbit pendant light is gorgeous!! That townsend chair is killing me. Browsing this shop makes my house feel so drab! loving the striped “love you madly” print! the reclaimed frame is so cute! The indigo striped throw is amazing! Well, hello there, Townsend Chair. Aren’t you a beauty? Love the table! Soo wish I had some extra cash to get the beautiful Indigo throws, or the ikat pillows! Love the set of three Nesting Tables. I could find 100 uses for them in my home, and I adore the design. I love the Jules Chest, but the Planetary Globe Light takes the cake for me! The Jack Table is absolutely my favorite. Love the size and style. The fact that you have two surfaces to accessorize (top and bottom) makes this table very versatile. i really love the Adele Chandelier. Ack?!! Pick just one? I love the Nina side table!! And, if I were on a shopping spree I’d also have to have the Owl Cookie Jar, the Planetary Globe Light, the Sunflower Antiqued Gold Mirror and the I Love You Much art print. Awesome shop. Thanks for the hook up! The Nina table pictured is my favorite piece. I LOVE the Industrial Steel Tripod Lamp. So classy and would be amazing in so many rooms of my house! Nina table, hello sunshine print, owl cookie jar! Oh i just love the Jules chest. It would be a forever piece! Amazing giveaway! I would love to have this little side table all to myself! I”m also in need of a bookcase, maybe something like the Isabelle bookcase on Chelsey Elizabeth Design.. The black Moroccan floor runner is gorgeous! The Industrial Steel Pharmacy Lamp is beautiful! I also love the Isabelle Bookcase! What a lovely site 🙂 Thank you! I LOVE the Townsend Chair!! How awesome! I did a lot of “Oh i love that chandelier, oh no that one! Oh wait… THAT one!” But my heart lies with the “Nathaniel Small Pendant.” How classy and I love the bird cage feel. NEED IT! Beautiful designs. I love the Henry Bistro Table. The Jules chest is AWESOME. I love the Modena bench! LOVE this site! Everything is incredibly beautiful but I’d have to go with the Isabelle Bookcase because I have PILES of books stacked everywhere. LOVE the boatyard poufs! Putting those on my must have list for when I redo my living room. Oh gosh, I love ALL of them! But the cafe chair, I think, wins out in the end. It’s simply gorgeous. Love the Isabelle Coffee Table. But everything is so lovely. My favorite is definitely the Matmi Caribbean Pillow. The design is gorgeous! Love the Nina table, Planetary Globe and Virginia Gold Chandelier! Oh so many beautiful things! I love the Blue Moroccan Floor Runner! The Raffia Fretwork Pillows are simply gorgeous! I can’t stop loving the Alexander Wall Table. Console tables can have fun, too! Wow, what a great shop! I think my favorite piece is the table in the giveaway, but also the Planetary Globe Light. Gorgeous! I really like the nina table! I am in love with the Townsend Chair and this side table would look amazing in my soon-to-be new apartment! I’m obsessed with the Bellamy Tufted Ottoman…it would make a perfect coffee table! I love the Sunburst Antiqued Gold Mirror! The gold nina side table is my favorite also!! Gorgeous! 🙂 Would love to win it! I am obsessed with the modena bench! so stinkin’ cute! I think i just swooned over the Townsend Chair!! I think my favorite is the Freemont Mirror. But I love the Nina side table as well – it would look great in my living room. Thanks! In love with the Planetary Globe Light! The best item on her website is definitely the virginia gold circles chandelier…it’s a knock out! It doesn’t hurt that my dining room is desperately in need of a lighting upgrade either. I love the Orbit Pendant Light! Aside from the amazing table you are giving away, I really love the Henry Bistro table with the paper lip like base! I’m loving the Henry Bistro Table, but I also love the little Nina Table in the giveaway. Thank you for introducing this sweet little shop! Besides the Nina table, I also love the Henry Bistro Table! Thanks for the giveaway! I love the Jules Chest and Townsend Chair! Wow what beautiful things!! I think this Nina table is my fav. so delicate yet bold! Thanks for this great giveaway! I love the Jules Chest and the Planetary Globe Light. Thank you for hosting such a fun giveaway!! I absolutely want the Isabelle Bookcase. One can never have enough bookcases! can I please have one of the indigo throws!!! LOVE! moroccan floor runner is beautiful. would buy! The vera pendant light is exactly the upgrade that my hallway fixture needs! I just got my first job out of college, so this would be a dream! I love the Nina table. Black Moroccan Floor Runner is my pick! Great pattern. My favorite is the Jules Chest! The Isabelle Coffee Table is my must-have. I love the Ethan Mirror. It would look great above my newly painted fireplace! I also really really like the vintage maps. The Modena Bench is so amazing! My favorite is the planetary globe light. Would make a great attention getter for my low key wedding! The Nina table is my favorite. The Bellamy Tufted Ottoman is stunning! I imagine curling up with a good book, it would fit perfectly in our bedroom! I love the planetary globe light, as well as the nina side table. I’ve been trying to downsize and really stick with pieces that I’ll love for a long time, and I think both of those would be great for that. My favorites are the Eliza Linen Ottoman and the Townsend Chair! They’re soooo pretty! I love the Isabelle Coffee Table! i love Henry Bistro Table!!! Most definitely a tie between two items but I do adore the Weston chair! Getting an apt and moving out of the ‘rents for the first time so everything looks beautiful!!!! I love the Isabelle Bookcase! the Alexander wall table is my cup of tea! i LOVE the To The Moon And Back art print. It fits perfectly with my style and I love the old movie reference. I also love the tube sconce lighting, but I wouldn’t have anywhere to put it. This french cafe chair is akin to caning work that my grandfather used to do. Rarely do you see anything caned now a-day! It’s definitely my “favorite pick”, with its fresh twist. Feel like I just fell into a Matchbook Magazine rabbit hole. That was awesome! I really love the Nathaniel Small Pendant. I would hang it above my antique vanity. Hope I win the table! I already know how I’d style that bad boy. There is just so much gorgeousness, but I LOVE the Mollie Coffee Table, as I think it’s something both me and the guy can love! Favorite item? Definitely that sidetable! The indigo dyed stripe throw is really gorgeous. The Indigo Dyed Circle Throw!! the maxwell stool would look amazzzzzing by an island. i love it! great giveaway! that Henry Bistro Table is ridiculously gorgeous! I really dig their lights…the Industrial Steel Pharmacy Lamp is killer!!! The henry bistro table Is lovely! Definitely adding Chelsey Elizabeth Designs to my home inspiration! so many beautiful things! I think my favorite is the Ethan Mirror but the Nathaniel Small Pendant light is a very close second. i love the Weston armchair! So beautiful! Really, everything on this website is swoon-worthy. Beautiful pieces on the site. The side table would go perfectly in my living room. Also love the cafe chairs, drew pendant light (for my kitchen we are renovating! ), freemont mirror and jules chest. Love the Mollie Coffee Table!! Beautiful table! Aside from that piece, my favorite item is the Square Chauncey Ottoman! I love the Weston chairs — would be perfect in my living room. I love the Freemont Mirror. I feels like a precious founf object you might come across in an antique store that would compliment almost any room or style. Swoon. The Sepia Triangle Throw is fantastic. Such a classic look! I’m loving the Isabelle Bookcase – those casters totally make it. I would love to have the sunray mirror. It would go perfectly above our fireplace! Loving the Alexander Wall Table, but the Nina Side Table is an absolute must for my bedroom. I really love the Nina table. So many beautiful pieces! I have been dying for some flowers for my desk-so I would pick the Peach Rose Watergarden. Not gonna lie, the Nina table you picked out is my favorite. Coming in at a close second is the Alexander Wall Table. I’m in love with the Planetary Globe Light. Industrial perfection! My favorite is the Chelsey Elizabeth Design Foster Side Table. Although it is mid-century inspired, it has a bit of a 1920’s / 30’s look to it as well. It’s gorgeous! Love the Virginia Gold Chandelier. The Nina table is a beautiful piece too! It’s a toss-up between the nina table and the henry bistro table. Wow that table is adorable! Love the lines. I think my favorite item in her store would definitely have to be the Sunburst Antiqued Gold Mirror. I’ve seen it in so many creative interiors above dressers, beds and dining tables, quite versatile! Love the Ceramic French Bistro Large Dishes and Small Plates. Love the Indigo Dyed throws! The Alexander Wall Table! That thing is amazing. love the artichoke sculpture set. Perfect for my dining room. The cherubino pillow would match my living room perfectly! Thanks! To be completely honest, I had a really tough time deciding on a “favorite.” Chelsey has so many unique pieces, it’s hard to pick a single one. I am passioante about lighting and pillows, so I would have to choose one of those. Amongst many other items I love the Adele Chandelier and the Virginia Gold Chandelier!!! the boatyard pouf is exactly what I’ve been looking for! The indigo dyed throws for sure! Such a nice shop! I like many things, but the sepia triangle throw is gorgeous! The Adele chandelier is my absolute favorite. I adore the rustic-mixed-with-modern-metals look, which also reminds me of the style of this gorgeous table! That table would also be beautiful in a sun room/porch! It’s lovely! I’m so in love with the round marble stand for displaying all sorts of delectable treats! That Sepia Triangle Throw with the Weston Chair…so cozy! I love the Maxwell Stool! I’ve always wanted stools like that. Those vintage maps are really wonderful! The Roland Coffee Table is gorgeous. Would go perfectly in my family room! The Weston Chair is such a beautiful piece. It maintains the traditional design while incorporating a modern feel. Love! I am really digging that Townsend Chair! Love the sunburst antiqued gold mirror! i love the planetary globe light. so many great pieces of furniture too! and accessories. and lighting. and and and. I absolutely love the “My Whole Heart” art print that says: “You have my whole heart for my whole life.” It’s gorgeous! I love the “Weston Chair”. So classic yet looks comfy to curl up in with a book. Oo oo oo The Virginia Gold Chandelier! It’s gorgeous! I actually love the Nina table you chose and the cute pendant lights. Thanks for introducing me to a new site! I love everything!! The boxwood is lovely, and those artichoke sculptures are so cute. Thanks for the chance to win! I love the orbit pendant light. so simple and slick! I love the Sunray mirror and the Nina table that you chose. Both would look so great in my home! Thanks for sharing Bri, fingers crossed. I really love the Maxwell stool, but I think my favorite is the Nina table! It is SOOO awesome! I love the Weston Chair!!! Cute shop! I love the Elsie chandelier. What a gorgeous table! I’ve been on a quest for new lighting for my dining area and I love the Drew Pendant Light. It’s perfect. Thanks for the giveaway! I really love the Elsie Chandelier. It’s really modern with a traditional edge. I love the brass finish and scale of the piece and can see this piece working in a variety of different rooms and with many different styles. I love the vintages maps of Chicago, Paris, and London. love the side table! and the isabelle bookcase grabbed my attention. well, a lot did. but that one i could picture in my house for sure! I love trinkets..so I’m automatically drawn to the Vintage Glass Bottle Assortment. Oh, how these would look so perfect in my home! I’m with you Bri-I LOVE the Gold Nina Side Table! It’s just perfect. I’m absolutely in love with the Isabelle bookcase – it would make the perfect addition to my large living/dining space in my new apartment! Definitely on the must have list! Secondly that Nina table is to die for! Such a perfect addition to my life! I love the nina table and the weston chair. obsessed with the Isabella bookcase. And the Henry Bistro table. And the Nathanial Small Pendant!! Ah! I think I’m gonna need it all. Love the Isabel coffee table! I love the five and dime candy stand! How fun! i love the Sepia Triangle Throw. beautiful. thanks for the chance to win! Loving the Henry Bistro Table! The moroccan floor runner looks amazing! The “i love you much” sign is beautiful. That table is kind of my favorite! Though, I also love the starburst mirrors. i adore the sunburst gold mirror. I am also loving silk flowers right now and their peach garden roses are lovely. Wow. So many nice things! But I have been looking for a bedside table and that nina is a beauty! I love the structure and design beauty of the Modena Bench! The the Alexander Wall Table is gorgeous- Id scatter plants across it. 100% the “My Whole Heart” print. The Nolita Aqua Pillow would look fantastic in my new apartment. I’m moving to Atlanta, 11 hours from my home town. I’m really sad about it but I have decided that if I make my new apartment fresh, warm, and cheery, I may be okay! I’m looking for colors that pop and this pillow has it all. I love far too many things! The Nina Table is gorgeous. I think that table is my favorite piece! I adore the Townsend Chair! The washed grey linen, the nailheads and the turned front legs make this the perfect accent chair. Thank you! I would love the orbit pendant light! I love the Murphy Footstool. It would be perfect for my living room! The sunflower antiqued gold mirror is brilliant, the perfect statement piece. What a great giveaway! I love the Isabelle Bookcase. It would be perfect for all of my books since my roommate is taking our bookshelf when she moves out in two weeks. Oh it would be so perfect to win that table! We’re using a kitchen stool right now lol! I’m such a sucker for lighting and that industrial steel pharmacy lamp is just TOO good. My husband would flip for the Foster Side Table or any of the Steel Industrial Lamps – he has an art nouveau meets steam punk thing going on. I love the simple shine of the Nina Table and the black and white Moroccan Runners. Love the Indigo Dyed Circle Throw! Love the Alexander wall table!! LOVE the Nina side table, the one that’s being given away! Also loved the Chelsea Side Table. Gorgeous stuff! Her furniture is AMAZING! The side table being given away is so unique and I WANT! Also, have to say i love the Weston Chair. i actually love this side table! I love the Sepia triangle throw! What a cool shop! I love the vintage London maps. My old stomping grounds in college! The sunflower mirror is also stunning. the indigo throws are so pretty and summery. Oh My! What a fab collection of pieces you have found here! I am in love with the Nina and it’s sister piece, the foster side table! Both are exceptionally perfect! The maxwell stool is gorgeous! i am LOVING the vintage maps, especially the 1899 paris map! Those Ceramic French Bistro dishes – wow! my fav is the sunburst antiqued gold mirror. such a fun accent piece! Wowsers! I am in love with this store! My fav pieces are this nina side table and the Indigo Dyed Stripe Throw! Everything is so awesome, but the Jules chest is a MUST! I’m really loving the Henry Bistro Table! The Henry bistro table looks like it’d be a subtle yet unique accent to any space! I actually LOVE that side table. I’ll be moving into a new apartment soon (hopefully!) and that would be splendid. After looking at all the items, I would have to say this gold nina side table os my favorite!!!!! It is just the piece I’ve been looking for to finish off my living room and it’s modern look will help give a fresh look to the whole room!!!! The Nina side table is literally my absolute FAVE, and would go perfect in my house! Such lovely home goods…! Besides the side table, I also adore the Fremont Mirror! I think you picked the best piece as your give-away! The Nina Table is flawless and would have such a happy life in my little home. The Isabelle bookcase is beautiful!!! LOVE the gold antiqued sunburst mirror. I love the nesting tables but this Nina gold table is beautiful, too! Whoa this stuff is fantastic! I love that Townsend chair! So many beautiful things. Loving the Alexander wall table, Isabelle bookcase, and Free Fall painting. And I adore the side table in the giveaway. What a pretty collection of home goods! I love the bookshelf inspired by Italian scaffolding, the quirky owl cookie jar, and the sunburst mirror. I love her furniture design, and all her accessories are beautiful – but I’m particularly fond of her square boxwood wreath – it’s so modern and simple, but remains classic at the same time. Beautiful! The Isabelle bookcase is my fav. I think that the Nina Table is my fav! Pretty obsessed with this Nina table and the Planetary globe light! WOW! Did you see that Jules chest of drawers? That’s something to build a whole room around. Inspired site, filled with so many exquisite things and I love the side table in the giveaway, too. Pick me, please! Thank you for the chance at such a lovely giveaway! i like the set of three nesting tables! I love the industrial wire bins, and of course, the side table is amazing! The Bellamy tufted ottoman is gorgeous. The Henry Bistro Table and the Freemont Mirror! WHOA! LOVE the orbit pendant light…actually saw that on Pinterest (or one similar) and never knew where to find it. It was hard to pick just one item! That table is gorg too. I LOVE the Sunflower Antiqued Gold Mirror! I love sunburst antiquated gold mirror and the Isabelle coffee table. AND this side table! Really simple, but elegant: it’s beautiful! Loving the Isabelle Coffee Table! love the super-classic maxwell stool!! Well damn, that Nina side table is exactly the kind of table I’ve been scouring flea markets for to put in our entryway. Love love the Sunray Mirror! I love the Creperie stand – how adorable! i love the henry bistro table! I love love love the Isabelle Bookcase! I am believing that this product is actually my favorite! The townsend chair; extremely versatile, would look amazing in my new apartment! the townsend chair is gorgeous! LOVE it! oooooh! the industrial steel lamps or the foster side table! ooor any of blue ceramic dishes. and of course i love the nina table as well! great shop! great giveaway! fingers crossed! The freemont mirror is my favorite! I love the Townshend chair. beautiful. Aside from the Nina Table in the giveaway, which kind of makes my heart melt, if I had $800, that Isabelle coffee table would be mine. Sigh. I just fell in love with the Townsend Chair! The Maxwell Stool is my favorite! Perfect combination of industrial and rustic charm!! Actually the gold nina side table is my favorite item, though I also love the Ceramic French Bistro Dishes, such lovely standout items! In addition to the Nina side table, which is beautiful, I’d have to choose the Sepia Triangle throw. Thanks! I’m loving the Sunburst Antiqued Gold Mirror! I love the chauncey ottoman! it would look great in my bedroom! But i guess if I do have to pick , I’d say the Nina table which you have shown above. It’s awesome. Oh and really liking the Freemont Mirror!! Such a great store! I’m majorly crushing on the owl cookie jar! That nina table is my fave hands down, but also loving the moroccan rugs, the planetary globe light and all of those gorgeous patterned pillows! the modena bench is my favorite! love it all! The Weston Chair and Nina Table are both so gorgeous! Love that Maxwell stool. Might have to pick up a pair! i think i love the nina table the most! i know that’s unoriginal, but it’s so beautiful!! I love the nesting tables. I love that table! And also the Isabelle book case. That vintage 1899 Paris map is calling my name! Ironically, that gold side table is exactly what I would pick from all the gorgeous items on the site! The Orbit Pendant Light! So space age. My favorite item was the Black Moroccan Floor Runner. Although the site had many things that pleased my esthetic.. thnks love to all. I love the Weston Chair. The Townsend Chair and Isabelle Bookcase are so lovely. I love the airy, graceful, and comfortable feeling of these two items. I love the Modena bench and, of course, this Nina table!. The perfect mix of cute and fancy, thanks for the recommendation! i think my favorite piece might actually be the nina table! I am loving the Isabelle Bookcase! I’ve been wanting similar to the Boatyard Pouf forever! LOVE the industrial pharmacy lamp! As a candy lover, the Five and Dime Candy Stand is pretty amazing. That side table is just perfect. I also love the Zara footstool! LOVE the Boatyard Pouf! Fingers crossed!!! I am so obsessed with the Sunburst Antiqued Gold Mirror! It’s perfect. The Adele Chandelier is wonderful. I love this! The murphy footstool and the alexander wall table are also right up my alley. I love all of it! I like the five and dime candy stand, so fun! I LOVE the Sunburst Antiqued Gold Mirror! Definitely going on my wishlist. I love the Freemont Mirror…but the Nina Table might really be my favorite thing!! That side table is beautiful! In addition, I also like all their throws! I love so many things! But the boatyard pouf is pretty fun. Well, everything is absolutely stunning…but I actually love the Nina Table so so much! I’m moving in two weeks and we are looking for great furniture pieces to add to our living room and this is just perfect!! I love the industrial pharmacy lamp! The Modena Bench is just beautiful! The Weston Chair and the Alexander Wall Table are fantastic! The Weston Chair is beautiful! let’s just say that the isabelle bookcase would be a lovely lovely addition to my home! love the side table being given away as well! Thanks for the chance to win!!!! Love the Vintage Revolving Candy Jars!! I love this side table and the freemont mirror! I am in love with all of the starburst mirrors!! LOVE! I am in LOVE with that Nina side table – it would look perfect in my new bedroom I’m working on! I also love the Sunburst Antiqued Gold Mirror – or the Freemont Mirror, I can’t decide! i’m loving the set of 3 nesting tables! The Maxwell Stool is just awesome! What a cool piece. The planetary globe light is absolutely stunning. It would look amazing in my entrance way. Love the Townsend chair! And this table! The gold nina table is my fav. So pretty! I’m not exaggerating when I say, I love EVERYTHING on her site! My fav might just be the Owl Cookie Jar. Or maybe this side table. So hard to decide! I’m really into the Planetary Globe Light and the Foster Side Table – I would totally put both in my bedroom. So many great pieces to choose from! The Freemont Mirror is gorgeous. The Virginia Gold Chandelier is my favorite! Love the circles! The foster side table is lovely; it would look great in my living room or as a bedside table. Gorgeous! I love the Maxwell Stool! I have been dying for a pair of these for my kitchen island! love love love! her site is filled with goodies. I’m also loving Sunburst Antiqued Gold Mirror http://chelseyelizabethdesign.com/collections/accessories/products/sunburst-antiqued-gold-mirror — Fingers crossed I win this gorgeous table! I love the Hello Sunshine print! And all the mirrors! What an awesome giveaway! The Alexander wall table is calling my name – how gorgeous! Thank you for introducing me to Chelsey Elizabeth Designs! What an amazing site. Besides the side table, I LOVE the “Always Keep Your Beautiful Imagination” print. Thanks for a great giveaway! I really like the side table and the Townsend chair is super cute as well. the katrina chandelier is beautiful. the henry bistro table looks like such a classic! and that side table is splendid! Honestly, the table (http://chelseyelizabethdesign.com/collections/furniture/products/nina-table)! I’ve been dying for a gorgeous cocktail table, with a small footprint, to nestle next to my peacock blue mid-century sectional. I dig the balance of exotic with clean and this table is perfection – jewelry for my space, ya know? So divine and am smitten! The Jules chest is gorgeous! I would love adding that rustic feel to my NYC apartment, along with the golden glint of the nina side table! The Adele Chandelier is so perfect! Lighting is one of my favorite ways to improve the look of a room! Henry Bistro Table for the win! Their stuff is super cute. Truthfully it’s really hard to choose because so much of it is right up my design alley. 🙂 The bistro plates are gorgeous, I’d love those. I adore the antiqued print that reads “Always Keep Your Beautiful Imaginations and Exquisite Humor”. I love the whole site though…and this table especially! I love the Freemont Mirror – what a beautiful piece! Eek. I can’t decide between the Modena Bench and the Townsend Chair which one I like best! Absolutely love Chelsey Elizabeth. I am glad you featured them. I have long adored the Modena Bench, as I can easily picture it in my lanai decorated with fun pillows and different sized frames/plants hanging above on the wall! I can go on and on! So in love with the Henry Bistro Table! The Ethan Mirror is my pick!! I am obsessed with the ceramic blue plates and dyed indigo textiles! Love this site (and that table would look lovely in my city apartment — no pressure –). I love the sunburst antiqued gold mirror. I love love LOVE the Nina Table. My husband and I are really wanting to decorate our apartment with some fabulous pieces and this would make a stunning beginning. Have my eyes on the Isabelle Bookcase for all of my favorite reads and keepsake tchotkes. Love those Ikat pillows! Gorgeous. I love the carrington vanity jars! Makes the ugliest things like q-tips, pretty! The Freemont mirror is gorgeous! Also in lurve with this side table. Cute! the side table is wonderful, but i’ve been on the hunt for dining room lighting and i’m really digging the pendant options! pick just one? you’re making it difficult. the sunflower gold mirror is really fantastic, and i’m drawn to the unique five & dime candy stand – what a conversation piece (not to mention the fact that it caters to my insatiable sweet tooth). The Isabell bookshelf is pretty awesome! It looks like something I would have in my studio, but would want in my house to incorporate the same “vibe”. Great stuff! The Virginia Gold Chandelier is so elegant and timeless! I love the Nathaniel Pendant! I love everything on this site! The Mini Sweets Dome is amazing, but the Revolving Candy Jars are totally my thing. Well, besides this table (because it’s amazing) I’d have to say the vintage Paris map. I’ve never been, but I’ve been having a love affair with that city for a looong time. That Alexander Wall Table has me swooning!! LOVE. The Mollie coffee table and the French Bistro dishes. Love the Alexander wall table. I think it would be lovely as a hall table. So many nice prints and textiles as well! I think I can honestly say that the Nina Table is my favorite! Haha. The Virginia Gold Chandelier is intriguing too. I love so many things: the orb pendant, Moroccan runner and the French bistro plates. Thanks for the chance to win. xo. Sorry, totally want to pick another .. The Moroccan floor runner (blue)! That`ll definitely spice up the new dorm room! I love the Alexander wall table! I REALLY REALLY love that Nina side table! The Virginia Gold Chandelier is amazing!! Would look so good in my new dining room! I do adore that table, but I also am loving the Small Indigo Tie Dye Pillow….not usually my style but the color is BEAUTIFUL. Sunflower Antiqued Gold Mirror…breathtaking. What a gorgeous statement piece. Beautiful color and dynamic piece. It looks like it’s moving and glowing sunlight. The Vera Pendant light! Gorgeous! My favorite is the Isabelle Bookcase and the Maxwell stool, to climb up to get that top shelf, so adorable! Oh, what a beautiful little table! I also love the industrial steel pharmacy lamp on their website. I adore the My Whole Heart print – that’s a special saying that my boyfriend and I share! The isabelle bookshelf is pretty grand! I love everything in her shop. if money grew on trees! I’m obsessed with the Sepia Triangle Throw! the three nesting tables are super cute. For my very first “adult” apartment after I graduate college the Vintage 1899 Paris Map would be so romantic and perfect! Love this sconce! It’s a great mix of fem (intricate, ornante) and masc (industrial, functional) design that would work really well in my apartment. Silver is always love, too. I LOVE the Boatyard Pouf! It might be joining my living room soon. that henry bistro table is to die for!!!!!! love it!!!!! My favorite from the furniture section is the very same nina table that’s being given away! That isabelle Coffee Table is the stuff of dreams. I’m always looking for those rustic and classic pieces that mix and match with more polished, classic pieces. i’m smitten with that nina table–it’s exactly what we’re looking for to tuck between two upholstered chairs in our living room. everything this else in the living room is just too boxy–time to lighten things up with some curves! thanks for the opportunity to win. i love the foster side table! love the henry bistro table! I think the Nina Side table is probably my favorite, or maybe the Henry Bistro Table. Thanks for the giveaway. Good Luck to me! the henry bistro table is stunning!!! such a statement piece! The Foster Side Table is perfection and so on trend right now! Having an obsession with golds and coppers lately. I LOVE the bistro table and of course this nina side table ( It would go in my office!). I really love the Isabelle Bookcase! this table is my favorite! OBSESSED! Adore the Adele Chandelier. Would kill to cheers underneath this with my friends. Thanks, Bri! The Townsend Chair is stunning!!! Oh, HELLO, Fremont Mirror! I can see you on my bedroom wall already…And I’m pretty obsessed with the Nina Table! The Nina table. So perfect! Such pretty products!!! I love the maxwell stools! They are so cool!!! I am all about this table!! Love it! Also really feeling that Modena Bench – so unique! I love the Modena bench and the Nina side table! What a wonderful collection! I would love to hang the Orbit Pendant Light in my kitchen! I want the planetary globe light – AMAZING! I mean… does it get better than the Nina table? No! Love it. I’m loving the Sepia Moroccan Pattern throw. so much great stuff! That Foster Side Table is amazing! It reminds me of The Great Gatsby. Vintage Revolving Candy Jars please! I love the Ceramic French Bistro dishes! I love the royal chevron pillow! Crossing my fingers! I love the fester side table! So cute! Ooooo…those Kantha Quilt throws. Awe inspiring craftsmanship and an amazing slice of cultural tradition! My favorite is the Isabelle Bookcase! The Nina Table is TOTALLY my favorite! Love the Isabelle bookcase and Townsend chair! I love the freemont mirror! but I’ve actually been eying this table for a long time too. My favorite are the three nesting tables! so cute! I love the selection of sunburst mirrors! Love the Black Moroccan Floor Runner- adore the chevron pattern! Having sat through a 4 hour GoT marathon at my friend’s house, I grew to appreciate the comfort of an ottoman. I really like her tufted ottoman. 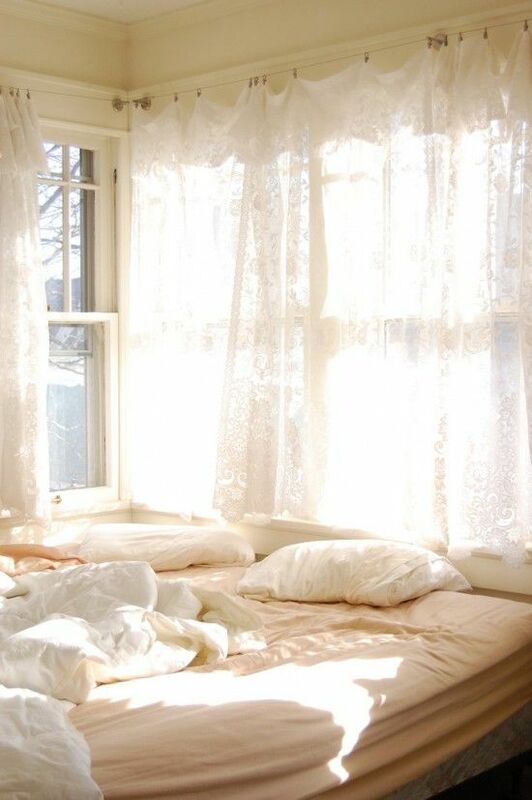 It looks both feminine and cozy. I love the Virginia Gold Chandelier! I’m in love with the grey print of londo. I love maps, and map -art..and London has such an amazing story that’s told through it’s landscape. I would love to have this hanging in my house! I really like this table and the indigo blankets! I love the nathaniel small pendent light fixture. so pretty. The Orbit Pendant Light’s clean and industrialised styling would look amazing in a row of 3 above a dining table/kitchen bench. lovely. I love the Foster Side Table & the Nina Table 🙂 Both are fabulous! Pick just one??? I want to surround my table with the Cafe Chairs, put all of my green plants on the Foster Side Table, store my dishes in the Jules Chest, and lounge reading on the Modena bench with my glass of wine resting on the Nina Table……swoooooooooon. the Townsend chair would go great with this beautiful table. Hmm, where do I begin? I visit chelsey elizabeth design and start to look for products I love. As I search, I see the Foster Side Table. Love it! Then I continue to scroll down and see the Maxwell Stool, then of course, the Nina Table and the Virginia Gold Chandelier. Love, love, love, I can’t decide! Then, all of a sudden, hold on…there it is, a Nathaniel Small Pendant Light. Wait a minute, “My son’s name is Nathaniel!” My heart sinks and I instantly fall in love because it reminds me of him and I can’t help but smile. How sweet, a unique, beehive shaped fixture set in an antique gold finish. Wonderfully original and one-of-a-kind-Just like my son, Nathaniel. I love it and l Iove my little guy! i love that sunray mirror! so gorgeous! So hard to pick a favorite! I’ll go with the freemont mirror – love the simplistic beauty and graphic lines. I love the industrial wire bins–exactly what my desk organization situation is missing, although I just want to live in this shop! The Henry Bistro Table! I have a lot of mid century stuff going on in my place, and some hairpin legs on a few of my tables– this would fit perfectly! I love the Isabelle coffee table and I especially like that side table! Would be thrilled to win it! Loving the sepia triangle throw! that was a really hard choice, but I like the Eliza linen ottoman. i can see many of these items sprucing up my apartment, but i must say, you’ve chosen a great giveaway – the nina table is by-far my favorite! i’ve been looking for exactly this table to hold up a couple of plants, books and a vintage camera. crossing my fingers that i win!!! The nina table is gorgeous! I love love accents of gold in my home. ADORE the Foster Side Table! I kind of totally die over this side table! I’ve been on the hunt for months and months for the perfect side table for my bedroom, and voila! There it is! The Isabelle Bookcase is stunning! The Isabelle Coffee Table is beautiful! The Anthony Mirrored Cube is beautiful! i really like the townsend chair. the table and chair would be awesome to have for my new apartment. Oh my! That table is adorable, and the Katrina Chandelier…amazing! Love this site! Thanks for the giveaway! The nina side table is my fave! My favorite piece is the Isabelle Coffee Table because it has a modern look but is timeless enough to go with lots of different styles. You could also dress it up or down depending on your accessories. EVERYTHING. This is not a good find for someone that just bought a house. I will surely be buying everything! AH. Oh, yes…my fave: Alexander Wall Table. love the Bansuri Slate Pillow! So many cute things! I LOVE the Sunray Mirror! I am very much in need of lighting in my living room and I’ve just decided that I’m now in love with this planetary gold light. It would be PERFECT with my oversized frame and chevron walls!! Also, this lovely side table would be a perfect match/mismatch/best kind of match. Love!!! Love the NINA TABLE, of course! That Nina table is pretty stunning. I also am loving the foster table and the salvaged canvas pouf! The Nina table is my favorite! Thanks for the giveaway, Bri! Love the french bistro dishes! Love the gold Nina side table!!!! The Vera Pendant is very pretty! The townsend chair is really cute with its nailhead detail! I absolutely love the Nina table and the hello sunshine print! This website makes me smile! I love the Bellamy tufted ottoman! I’ve been wanting an ottoman for a while now, and this one is so beautiful and classic. I absolutely love the sunburst antiqued gold mirror! So fun! I love the Isabelle Coffee Table; chic & rustic! Such lovely things!! I am swooning for the industrial steel pharmacy lamp and the drew pendant lamp!!! I love the Sunburst Antiqued Gold Mirror, but I think the side table being given away is my favorite! Thanks for hosting the giveaway! i love the alexander wall table! i actually love everything, all the furniture. too hard to chose! My fav would have to be the Foster Side Table priced at $398.00!! SO many pretty things on her site. My favorite thing is the Henry Bistro table. Modena Bench is lovely… would love to read books while sitting on this. I’ve been looking for a bar cart and I’m in live with the gold Nicoline Serving Cart. Anything with a gold/brass catches my eye! okay, did we all see that townsend chair?! just knowing something as beautiful as that exists in this world helps me sleep at night. what doesn’t help me sleep at night is knowing i dont own ANYTHING from that website. I love the nicoline service cart as well as some of the other commenters. Perfect amount of fancy without too much fuss! The Industrial Steel Pharmacy Lamp…I need it to sit on my desk and make me happy forever. Or maybe on my new side table…. Mind. BLOWN. How is this the first I’m hearing of this shop? (I thought I was an advanced internet lurker). So many goodies. I love me some of those throws; they remind me of Lao textiles actually. But I cannot tear my eyes nor my mind away from the “Virginia Gold Chandelier”. My favorite piece is definitely the Artichoke Sculpture Set! I have a collection of white porcelain sculptures and figurines and I couldn’t think of a better piece to complete it! Amazing stuff! Love the Free Fall painting. i’d love to put a couple of the drew pendent lights in my kitchen! The Henry Bistro table would be perfect for a small niche in my living room. I’d love to pile it full of books and a giant terrarium! Thanks so much for the great chance to win, and a look at Chelsey Elizabeth! I can’t stop daydreaming about the Townsend Chair! Love the orbit pendant light!! I loooooove the Moroccan floor runner!! Definitely the “Five and Dime Candy Stand”–a perfect piece for the island in my kitchen! oh my. the townsend chair is gorgeous! gold nina side table IS my favorite! I love the artichoke sculptures! So fun and modern! The Isabelle Bookcase is just so COOL! Thanks for the opportunity. Um. Favorite item? Singular? I want one of every piece of furniture, the free fall painting, and vintage revolving candy jars. Dream big or go home! Everything on the site is GORGEOUS! I am loving the Linford Swivel Chair and the Alexander Wall Table – definitely adding those to my wish list! Nicoline Serving Cart would look perfect but so would the Nina Table ! This table is amazing! I also love the Black Moroccan Floor Runner! i love love love that nina table! i want it so badly! LOVE the industrial steel pharmacy lamp! Five and dime candy stand is so much trouble and yet so much fun! I love the Bellamy Tufted Ottoman! that Genell Side Table is totes gorge! All of the ‘Hello Beautiful’ ‘Hello Darling’ framed art are so well… darling! The Isabelle Coffee Table is so amazing! A toss up between this loveseat, and the end table you’re featuring! So many gorgeous choices! I love the Freemont Mirror! Everything they have is gorgeous. I love the Nina table or the Zara footstool. the large dotted silver jar just makes me so happy! it perfectly accentuates any shelf, centerpiece, or bedside table. So many amazing pieces.. But the Henry Bistro Table captured my heart! I love the Industrial Steel Pharmacy Lamp! The Townsend Chair for me, please! LOVE the Isabelle Coffee Table. The Jules Chest of drawers is gorgeous. I love the Isabelle shelf! I LOVE the alexander wall table and the genell side table. Gorgeous pieces! The Weston Chair is turning me on right now. My living room space seems dark and in need of some brightness and I appreciate the detail in this classic chair. So very comfy. The Bellamy Tufted Ottoman looks super comfy! Pretty obsessed with the Plaisance console table. It’s industrial, but chic & & that’s what I love about it. There are so many cute items on this site it was hard to choose just one!! I loved the Zara ottoman and the vintage Paris map. Both would look fantastic in my apartment as would that amazing side table! I love the Weston chair! Scrumptious! Beautiful stuff! I’d take the antiqued gold sunburst mirror. The entire collection is lovely and eclectic – but my FAV is the Foster Side Table. Haven’t seen anything like it. Cheers! I like the indigo dyed throw the best. That table is incredible! It may be my favorite item at Chelsey Elizabeth Design. Or maybe the Planetary Globe Light! Love the coir black runner. I LOVE the Henry Bistro Table. It remins me of my childhood for some reason. The texture is beautiful. It’s a perfect table for a cozy home. loving the moroccan floor runner! gorgeous! I’d have to pick the Maxwell stool or Planetary Globe light. Industrial and Chic. That modena bench is gorgeous! everything is amazing but I adore the Virginia Gold Chandelier! I adore the Fremont Mirror. So gorgeous! Ohh the cherubano pillow. Want. Of course the table is also stunning! The Alexander Wall Table is a dream and a half for my new San Francisco apartment and big city life! The Jules Chest is absolutely beautiful! I love the simpleness of the chest, while still being a classic and chic piece! The Townsend chair and this table are beautiful!! The Nicoline Serving Cart would be an amazing addition to my dining room! love the orbit pendant light! The Weston Chair gets my vote! oh goodness i love EVERYTHING on the site! the boatyard pouf, ikat pillows, all the throws, the modena bench, linford swivel chair, the isabelle coffee table and the industrial steel lamps… sigh. i want them all! thanks for introducing me to this site! i guess i have to pick so i pick: the henry bistro table! I like the Orbit Pendant Light but I think the side table is actually my favorite! thanks for the chance to win! The Genell Side Table is my favorite…made of solid iron but antiqued for that ‘classy brassy’ look, and the minimal ornamentation is ever-so charming 😀 I can’t decide whether I’d set it next to my sofa with books and drinks or next to my wall-of-windows with my new spring flowers on top! And now that I think of it…it would work perfectly as a bar! I love the bold zigzag patterning of the Moroccan floor runners. So stylish! I’m diggin the Townsend chair! Lve all of them! Such an nice Page!!!! Love the ikat pillows and dotted silver pieces! That table is my absolute fave! I would showcase it in a room with the black Moroccan floor runner and the orange cherubino pillow. Swoon!! I love the Indigo Dyed Stripe Throw-such a beautiful blue that would be great on my bed! The Nina side table would be perfect for my living room! It would be the best thing ever to win! Thanks for the great giveaway! Thank you for turning me on to Chelsey Elizabeth’s site! The gold nina side table is the perfect side table, I love the lines. The Isabelle Coffee Table and the industrial wire bins are exactly my aesthetic! I love love love the Jules Chest! I heart the planetary globe light. So unique! I love all the furniture but if I HAD to pick, I would choose the Linford swivel chair! My favorite is the Linford Swivel Chair! i’m so in love with the Artichoke Sculptures Set it’s so beautiful ! I just got a new place and have been looking for some pieces to give it some more character now that my big pieces have been put in place. I have the Nathaniel Small Pendant on my wishlist right now. I want to put it in my dining room to replace the stale generic fixture that came with the place. And the price can’t be beat, I’m glad I read this! I was about to buy a chandelier that was quadruple the price! Thanks! the Planetary Globe Light! So cool!! Looooving the Lindford Swivel Chair! wow…so many beautiful pieces… I would love the Globe Pendant, but I truly need a couple of side tables and the Nina Side Table is the perfect size… good luck to everyone! I am a sucker for lighting and LOVE the Virginia Gold Chandelier. I think the Nina Side Table is absolutely stunning…would fit perfectly between my bed and my bookshelves! Are you kidding I have to CHOOSE a FAVORITE?!?!? Ugghhh. EVERYTHING. But particularly the Eliza Linen Ottoman. Totes adorbs. The industrial steel pharmacy lamp is classic and stylish. I’m a sucker for lighting! You did good… I have to go with the Nina table too!! So sweet!! i’ve been looking for the perfect side table – i think the gold nina side table is it! love it. My favorite item would have to be the Weston Chair. I love how modern it looks. I’m thinking it can be in a room filled with neutral colors but accented by other color pieces. There are some pretty blankets, but I think my favorite item is actually the Nina side table. So pretty! And it would be lovely in my tiny living room! All of it! So many beautiful items. I have been looking for a unique chandelier for my dining room and and I really love the Virginia Gold Chandelier. The Henry Bistro table is perfect perfect perfect! It’s just the thing. And of course the little side table is just what I’m looking for, so fancy that if I won it!! I’ve been looking for a new coffee table – and though I never could afford this, the Mollie Coffee Table is very nice. I think I like the Gold Nina Side Table more though! Thank you for this opportunity! love the foster side table! I’m obsessed with pendant lights and Edison bulbs, the Drew Pendant Light is a fantastic combo of both! I would get the Genell Side Table and use it as a bar cart! would LOVE the Planetary Globe Light for my dining room! I would love the Sunburst Antiqued Gold Mirror!! I just moved and need something to brighten my bedroom! In love with the Alexander Wall Table! I love the Ceramic French Bistro dishes–they remind me of the Delft plates my grandmother had in her china cabinet. Adele Chandelier and Maxwell Stools – great site!! …my living room could also use the Genell Side Table. What a delightful curated site. I need a side table so bad for my living room, I hate having to reach over to grab my phone or glass of water on the other side of the room! The Nina table is perfect! Love the metal and wood mix on the Martel Side Table. Beautiful light fixtures, especially the Virginia gold chandelier. Love that Alexander wall table! The “I love you much” print, the Vera pendant, and the Nina side table. What a beautiful shop! The Genell Side Table would look fabulous in my living room! The Industrial Steel Tri-pod Lamp is fabulous! I love the Modena Bench! So cute for an outdoor patio. I love love love the Townsend Chair!!!!! Love the nicoline serving cart! Been looking for a bar cart for a while now…. I love the Genell side table as well! I have a soft stop for the sun mirror. I’ve always loved them. Other than the Nina table (cute!) I love the Sunburst Antiqued Gold Mirror! the indigo dyed throws- so beautiful. 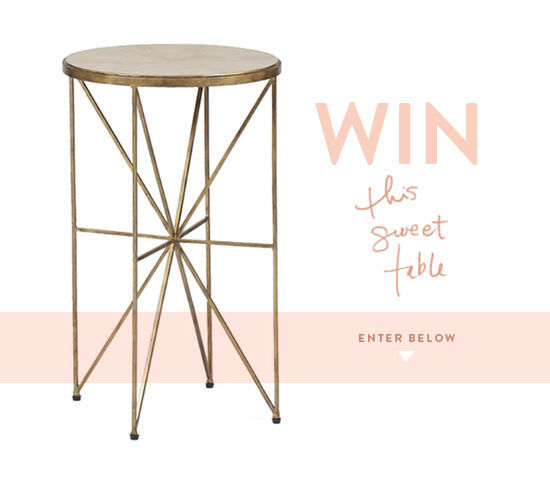 I pinky swear if i win this side table, it will be the styled so beautifully in my new home. Terrible decision maker over here LOVES everything. Like LOVES IT. CANNOT EMPHASIZE THIS ENOUGH. But, if threatened with my life and if “one of everything” is deemed an unacceptable answer, I would choose the Virginia Gold Chandelier! Can’t get enough gold in my life. So much good stuff, how about the virginia gold chandelier? I really like the freemont mirror or those quirky artichoke sculptures set. There are a lot of great items to choose from! I love so much of it! But, I would say the Hello Beautiful print caught my eye. I’d love to hang it in my daughter’s room. I love the Genell side table and the five & dime candy display! Why of course, the Genell Side Table! It’s absolutely divine! The Nina Table for sure! I adore the Indigo Dyed Stripe Throw! I absolutely love the Weston Chair! There are a ton of pieces I love actually! The Bellamy Tufted Ottoman would be lovely to have! I love the throws – the Indigo Dyed Circle Throw is so beautiful. THAT table is for sure my favorite! So many gorgeous items, hard to choose one. Really love the Nicoline Serving Cart. Absolutely LOVE the weston chair! I love the Industrial Wire Bins! I’m a lover of organization + good design. Love the Townsend Chair!!! What a great site to dream about for furniture in your house! Well well well the ceramic french bistro small dishes just make my heart go pitter patter. or is it padder? rock and roll baby. I have to say, in all honesty, that this Nina Table is absolutely 110% my favorite! It is gorgeous! Love the Nina Table!! So cute! Oh I love the Genell side table! Thanks for the giveaway Bri! I like the Moroccan Runner & the owl cookie jar! I would say the Isabelle Bookcase – love it! The nina gold table is great and I love the nathaniel small pendant also. Moving to NYC for grad school and would LOVE the Martel Accent Table for my new place. Crossing fingers!!! Xo. I’m looking for bedside tables right now! This one is beautiful. I pretty much love every pillow on the website too. The Planetary Globe Light! I’m closing on house tomorrow and this would look awesome in my new dining room. My favorite item has to be the Henry Bistro Table! Love those hairpen legs. That is a wonderful site! I’m so excited to learn of it! I really love the Black Moroccan Floor Runner- it would be perfect in my living room where we’ve recently added several black and white graphic elements. Well, I would LOVE that table or the Adele chandelier!! Thanks for the giveaways!!! Mollie Coffee Table. Where form embraces function. Katrina chandelier! I would feel like a princess! That table is absolutely gorgeous, but I also love the Industrial Steel Pharmacy Lamp – it would be perfect on my current wooden nightstand. AHHh Townsend Chair Townsend Chair! Love the Moroccan flavor of the Nathaniel Small Pendant lamp. Firstly I am so excited to be able to participate in your give-aways since I’m back living in the U.S! Loved everything on her site but the side table pictured above and the print”To The Moon And Back” are definitely my favorites! -jb. The Virginia Gold Chandelier would be perfect in my dining room. The Weston chair is superb! This giveaway is such a lovely surprise…I’ve been without a bedside table for far too long! Beautiful! I am swooning over the Isabelle bookcase and coffee table. I have to say NINA is still my favorite. Absolutely lovely. That side table is amazing! My favorite thing is the artichoke sculptures set! They are so cool! Really diggin’ the Planetary Globe Light! I love the Sepia Triangle Throw! Really love the Nina Table. Simply divine and just what I’ve been looking for!! Thanks Bri for a fabulous giveaway! I love the Maxwell Stool. The steel and nickel finish is super unique and would take any room a step up. Gorgeous!! The Nina table is my favorite! I also love the Sunburst mirror. I actually think this table pictured would be perfect for my living room! The Foster Side Table is gorgeous! I LOVE the Orbit Pendant light. All of the side tables are really great. Love these designs! I love the sunflower antiqued gold mirror. I have had my eye on this table forever! I am so excited to be able to enter the giveaway. Besides the side table, I’m coveting the moroccan floor runner as well! I’m absolutely in love with the Nina Table and it’s artistic charm. I love the Linford Swivel Chair. I can just imaging curling up with a good book there! The Plaisance Console Table is KILLER. I just moved into a new house and am struggling to make it feel organized and settled, and I know this handsome piece of furniture would look perfect in my room! tennis love seat is classic! Honestly loving the Nina table, have the perfect corner spot for it next to my couch!! Next in line would be the Alexander Wall Table, but Nina is totally calling my name. Fingers crossed. love the indigo dyed circle throw! Would look great in my living room! I think the Jack table is pretty cool! Gotta love that Isabelle Bookcase! I love that Freemont Mirror. LOVE the Genell Side Table. Such beautiful lines. Definitely the Nicollette serving cart….STUNNING. The tufted ottoman would be right at home in my living room. And the perfect little side table is badly needed in my bedroom! This is my favorite piece: http://chelseyelizabethdesign.com/collections/accessories/products/sunflower-antiqued-gold-mirror I’m obsessed with it! I have so much gold and brass in my home and I always welcome more. I LOVE the sunray mirror! Thanks for an awesome giveaway! Omigod, the Katrina chandelier. WANT. I’m imaginary chandelier-shopping really hard right now (by which I mean finding inspiration to make my own) and that one is GORGEOUS. I love the Sunray Mirror. It would look great in my living room! Love the Alexander Wall Table! Well-curated collection. oh my goodness that brass nina side table is INCREDIBLE! I have to say, after looking through all the products at Chelsey Elizabeth, nothing tops the Nina Table for me! I am a total sucker for brass, and I love its geometric lines. The horn top lends such awesome materiality — I love it so much. Thank you for such a great giveaway! Oh my, the Temis love seat, Virginia chandelier and the churbino orange pillow have all stolen my heart. And the table is equally amazing. The Temis Love Seat is amazing! The planetary globe light is stunning! I love the sweet little peach garden rose. It would bring joy all year around! Love the Genell side table and the Isabelle Bookcase. Gorgeous pieces. I’m loving the French bistro dishes and the Genell side table. I’m a huge sucker for the industrial look and those industrial wire bins are gorgeous! The Foster Side Table knocks my socks off! Gorgeous! I am loving the industrial chic pieces such as the Isabella bookcase. All of the designs are lovely and would be a pleasure to own such a beautiful piece as the side table. Thank you for hosting this giveaway. I enjoy the Vintage Vineyard Demijohns. Bri, I would be bubbly with excitement to win the Nina Side Table – Chelsea’s collection includes some real gems that I’m excited to use in my styling escapades! Love the Alexander Wall Table! While the Nicoline serving table is dreamy, I actually think the Nina table is my fave. How can Chelsey Elizabeth bear to part with another? I love the sunburst mirror. Would look great in my new apartment! I’m in love with gold legged tables at the moment so its gotta be the Nina side table in the giveaway. And just about everything else! I love the black Moroccan floor runner. The Ethan Mirror is pretty fabulous as well! i really like the Alexander Wall Table. The Industrial Wire Bins are my favorite! oooh. such a pretty table. love the freemont mirror! Linford Swivel Chair, OH GOD. BEAUTIFUL. Want that chair in my living room so badly. My favorite is actually the Nina table! My fav is the Nina table! I definitely need the Virginia gold hanging light over my kitchen table! Love the Isabelle bookcase and the kantha pillows/throws! I love the Five and Dime Candy Stand! LOVE the Genell Side Table! Vert art deco! I love the vintage revolving candy jars! My sweet tooth will thank you! The Nicoline Serving Cart is amazing & would compliment any room! The vintage revolving candy jar is fabulous – I love it! I am in love with the Isabelle Bookcase! i love the Isabelle bookcase.It would fantastic in my painting studio. Oh my, the Modena Bench is gorgeous! Thanks for introducing me to this site! I absolutely love the vintage 1890’s Chicago Map in black! My entire family is from Chicago and I have a deep love for that city. I feel like it is in my roots and it’s such an amazing place full of life and history. The map is stunning! the nina table is fab. actually everything on her site is great. the nina table is great. Wow, this shop is amazing! Obsessed with all of it. I want the Nicoline Serving Cart. Girl, I need that cart now. Mmm. there are a lot of amazing things on here, and definitely one of my favorite pieces on here would have to be the ‘to the moon and back’ artprint. Amazing stuff! I love Moroccan Floor Runner ! Oh wow. How do you even choose? The Temis Loveseat would look pretty sweet at the base of my bed. I need 2 sidetables, so winning this one would be the best! Thanks! What a great giveaway! For our space, the Nina Table is actually my very favorite piece! Hard to pick just one favorite! I love the Sunburst Antiqued Gold Mirror. classic + gold + a little bit mid century modern. I love the Nathaniel Small Pendant light. It’s so glamourous! LOVE this nina side table, but also the Isabelle Bookcase! I love the Temis Loveseat. Love the Nathaniel Small Pendant. It would look beautiful in our small bedroom! I absolutely love the Linford Swivel Chair, its a modern approach to a classic. Fab. Love the look of the Genell Side Table! The Henry Bistro Table is my dream item on the site…amongst so many others. I imagine putting fresh flowers on top and surrounding it with mismatched white chairs…SWOON!!! I love the “You have my whole heart for my whole life” print. Seriously gorgeous. I just pinned a few items so I don’t forget this beautiful shop. Thanks Bri! Vintage 1899 Paris Map is beautiful, I love it. I love the Townsend Chair!!! The indigo dyed stripe throw may just be my undoing. It reminds me of a trip I took with my mom to India a few years back and I think it would be perfect for snuggling up on the couch in Minnesota (where there was snow on the ground a week ago!). The cafe chair is just adorable. The rattan gives it an old timey feel that makes it even more lovable, so much character! Love, love the Townsend Chair! Ooh, that planetary globe light would look perfect in my foyer. other than the nina table which is AMAZE! I love the Freemont Mirror & The Mini Sweets Dome. The orbit pendant light is my fav! I imagine hanging 3 in a row in my kitchen.. So steam punk meets romantic. Thank you for this giveaway, I really like the simplicity of the temis loveseat. Just today I thought how badly I could benefit from a small side table or night stand. This Nina side table is winning my heart! Great store! I’m a huge fan of the round marble stand! such a classic piece to keep on your table for fruit or dessert! the isabelle bookshelf would make my life complete. i love a lot of items in this shop! great giveaway! i love the table you’ve picked out, as well as the industrial lamps and the blue ceramic dishes. thanks! fingers crossed! I love the large dotted silver jar! So pretty! I would love to use this industrial wall sconce up my indoor stair case to my loft. It’s petite, handsome, and would add just the right of dimmed lit glam. it’s tough to pick just one favorite! is everything on the site a fair answer? 😉 i’ve been looking for a bar cart for a while though and the nicoline serving cart is gorgeous! The Virginia Gold Chandelier is so unexpected, I love it! i would love the henry bistro table in my dining area! love the Nicoline Serving Cart — would be a perfect bar cart! thanks for the giveaway! What they actually mean by this is what happens when you take prescription drugs? In 1996, only about 2% of all soybeans in the United Kingdom? If you cook in large batches, you can adopt a pet or get involved by way of buddies and families to keep you on track.